As Google Shopping Ads start to roll out in Thailand, local eCommerce sellers and advertisers are starting to familiarise themselves with this new (to Thailand) way of selling their products online. The process can be a little confusing for first-time users. Taking the time to review a few of our tips may help you gain a better understanding of shopping ad campaigns and how they differ to traditional search campaigns. Unlike the typical Google AdWords search campaign, you will not need to spend hours creating specific text ads or need to manage extensive lists of keywords and match types. Shopping campaigns take their information from a shopping feed linked using the Google Merchant Center. 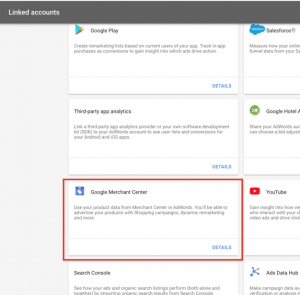 Instead of manually building campaigns and ad groups, the Google Merchant Center uses product data from your website to generate ads for your campaign, which are then managed through the standard AdWords dashboard. The ads that are created will show as Product Listing Ads and under the Shopping tab and provide more information to consumers than a standard text ad. The Merchant Center obtains your product information through your product data feed. This feed is a detailed list of the various products that you offer through your website. Information Included in the Product Data Feed. The product data feed needs to conform to a specific format set by Google. 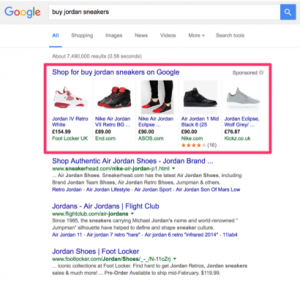 The formatting allows Google to understand the details of your products for the generation of Shopping ads. Each product requires a unique identifier, referred to as the Product ID. You also need to create a Product Title and Product Description. The title appears in your Shopping ads while the description appears when a user clicks and expands the ad. You also need to select a Product Category for each product. Google has a list of predefined product categories that should cover any product that you wish to sell. While the product categories are predefined, you get to define the Product Type. The product data feed will also include a link to the product page on your website. As your product feed updates, it will include the current availability of the product, the price, and the current sale price or promotional offer. The creation of the product data feed is one of the most important steps in creating a Google Shopping campaign as this is the information that the Merchant Center uses to generate your Shopping ads. Before you can start creating Shopping campaigns, you need a system for managing your data feed. The information that you upload needs to match the product information on your website. This requires you to regularly update your feed with any changes to the price or availability. There are three primary options for managing your product data feed. Using a spreadsheet provides the most direct method of updating your feed and does not include any extra costs. However, when you have thousands of products, manually updating a spreadsheet can be extremely time-consuming. Along with choosing a method for updating your feed, there are a few details to pay attention to as you enter product information. While Shopping ads do not rely on Target Keywords in the same way as standard search campaigns, you need to consider the use of keywords in your product titles and descriptions. This will help improve the relevance of your products to user search queries. You also need to ensure that your prices are completely accurate. If any of the information does not match the information on your website, your Shopping ads will not appear. This is especially important when selling products in more than one country. When selling items in multiple countries, you need to properly calculate the cost in international currencies. You also need to upload a separate data feed for each country and create a new ad campaign. Every product requires a link to the product page on your website. Before you upload your data feed, double-check the URLs that you provided to avoid any dead links. If the destination URL does not exist, your products will not be displayed in Shopping ads. The details discussed are important for ensuring that your Shopping ads appear online. However, the most important detail may be the product image. A low-quality image will likely result in lower CTR and Conversion rate. Images should be clear and in high definition instead of grainy and difficult to see. Do not edit the images or add watermarks. After you have created the data feed with your product details and developed a system for keeping the feed updated, you can link your Google Merchant Center account to your AdWords account and begin creating your first Shopping campaign. The process of setting up a campaign includes some similarities but also some major differences compared to setting up standard search campaign. As with a standard campaign, you can create Ad Groups to help organize and manage your campaign. Shopping campaigns still use CPC bidding; however, the process is different from search campaigns. As mentioned, you do not bid on keywords. You place a bid on specific product groups. The main product group includes all the products in your data feed. You can also create smaller groups for more control. When you place a bid, you are setting the amount that you want to pay for each click on your product ads. Similarly to a search campaign, a higher bid will often result in more impressions and higher placement in the available ad space. If you want the best return on investment, you should focus on how you choose to manage your groups and the CPC bids you choose for each group. Start by creating a product group for each major category of your products that you offer. If your data feed contains less than a hundred items, you may also consider creating a product group for each product. Pay attention to which products sell best. Over time, you may want to create separate product groups for your best-selling items. You can increase the bid for these groups, ensuring that your most popular items continue to receive online exposure. Keep in mind that these groups do not impact the relevancy of your ads to search queries. The groups are simply so you can control you max CPC. After organizing your products into various product groups, you can start to place bids on these groups. When you first get started, use slightly lower bids than you may use for standard search ads. This lets you evaluate the effectiveness of your campaigns without a significant investment. You can also use a feature called geographic bid modifiers. This feature allows you to decrease your bid in low-traffic regions and increase your bid in high-traffic areas. When creating your first Shopping campaign, enable mobile paid ads. However, keep track of the results of your mobile clicks. For expensive products, you may find users are reluctant to buy from their mobile device. There are several metrics that you can use to evaluate the performance of your Shopping campaign. Use this information to tweak your campaign. However, avoid making impulsive changes on small amounts of data. Always make minor changes and wait to evaluate the results before making additional modifications to your campaign. You may also examine the Google Benchmarks provided for your Shopping Campaign, however, these benchmarks are not the best set of metrics for evaluating your campaign. One of the more useful metrics to look at is the search Impression Share. This information lets you know the potential for growth of individual groups of products. You can compare your results with other businesses selling products in the same categories. You should also look at the Cost per Conversion data to determine the value of each product group. If the cost is high, you may need to adjust the times when your ads appear in search results. Instead of running your ads 24/7, you can select specific times of the day. In order to run a Shopping campaign, you must have a product data feed. This feed includes all the details of your products and it must be 100% accurate. Shopping campaigns provide a great platform for businesses that sell products online, eCommerce market in Thailand starts to boom, Google Shopping Ads will surely feature in most eCommerce digital strategies. How to Optimize Your Businesses’ Google Shopping Feed For Maximized Success! Which is the best Google Ad Network for your Product or Service? © Copyright Phoenix Media 2017 All rights reserved.